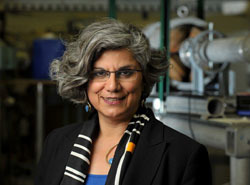 Ani Aprahamian, the Frank M. Freimann Professor of Physics, has been appointed to a three-year term on the Physics Policy Committee of the American Physics Society (APS). The appointment was made by APS President Michael S. Turner and is effective January 1. The Physics Policy committee addresses science policy issues that affect the development of physics, the health of the institutions in which physics is practiced, the resources available to physics, and the balanced use of these resources for the nation's scientific and technological needs.